Our (Brilliant) Stonewall Champion Launch: LGBT Pride!! 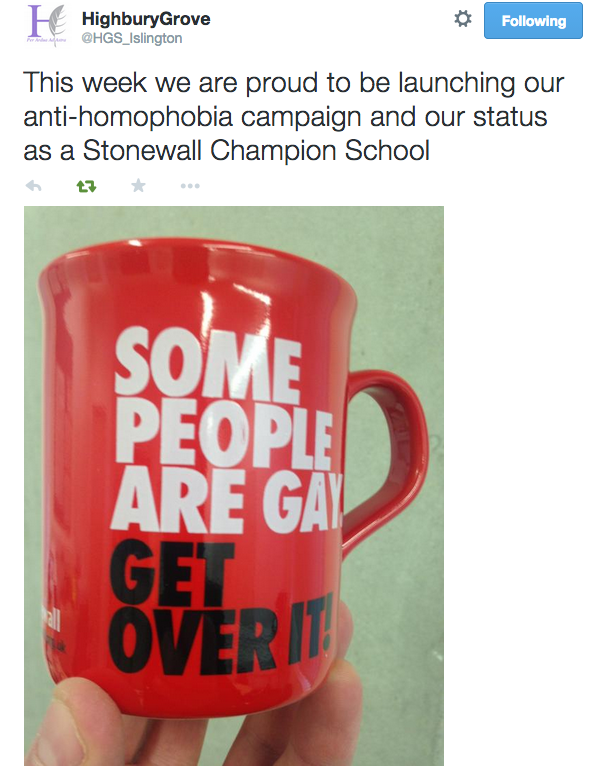 This week, I am was extremely proud of my school as we launched our new status as a Stonewall Champion School. 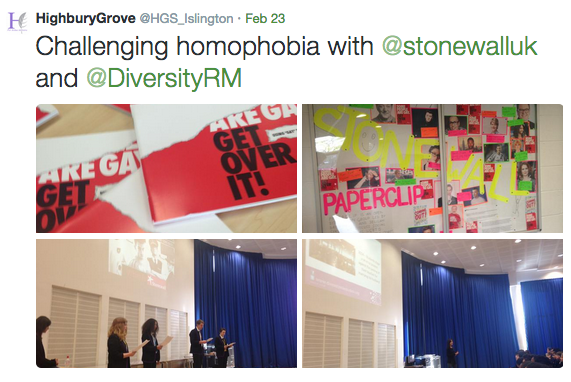 In a week of assemblies and workshops we’ve sown the seeds for a long-term process of changing attitudes: It’s not merely acceptable to be gay at Highbury Grove; it’s normal. It’s part of life. Everyone’s life. Twenty years ago,when the outrageous fall-out from Section 28 was still raging, (one of many reasons to despise the Thatcher regime), I was Head of PSHE at Holland Park in London. 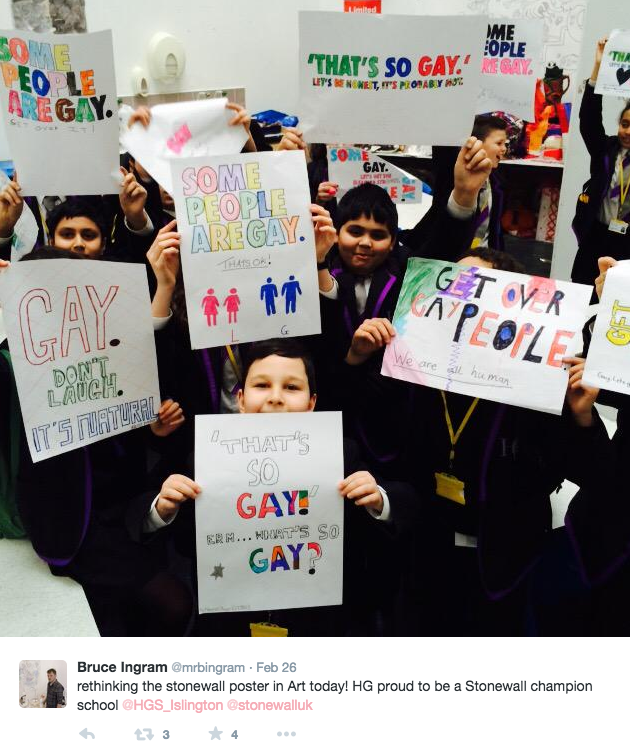 Members of Stonewall would leaflet students outside the gates on occasion and I asked the Headteacher if I could approach them to arrange workshops in the school. 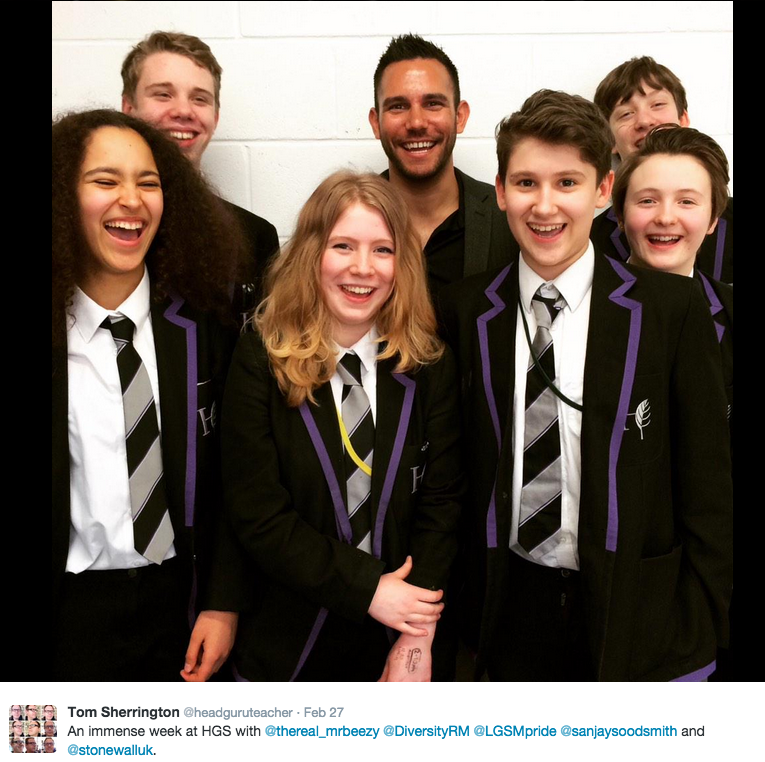 It seemed to me then that the best way to challenge homophobia (which was rife across the school) would be to invite people who could tell students ‘I’m gay and it’s ok!’. The Head said no. She was a liberal, progressive Headteacher – but this was seen as too risky; taboo; off-limits – even dangerous in terms of the potential for reputational damage and vilification in the media. Thankfully – we have moved on. 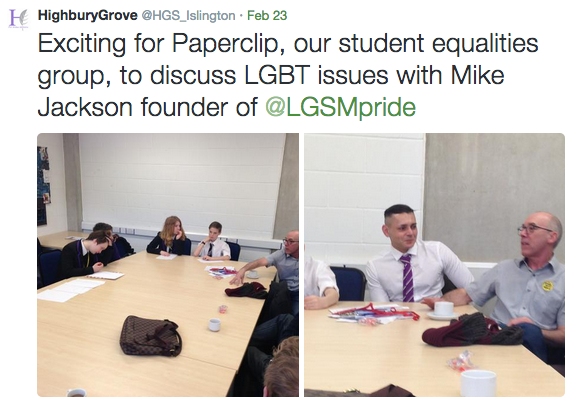 As I reported last year, we did some work on challenging homophobia at KEGS. However, this week, I am delighted to be connected to a school where the very thing I envisaged 20 years ago has happened. This was not my work – I just said ‘Yes’. 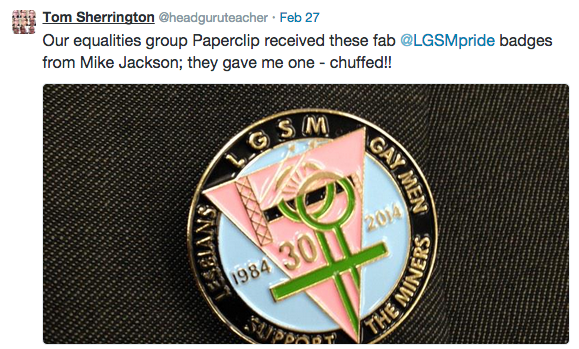 I am deeply grateful to Rachel, Bruce, Tony and, most of all, to Paperclip, our Year 10 Equalities Group, who made it all happen. 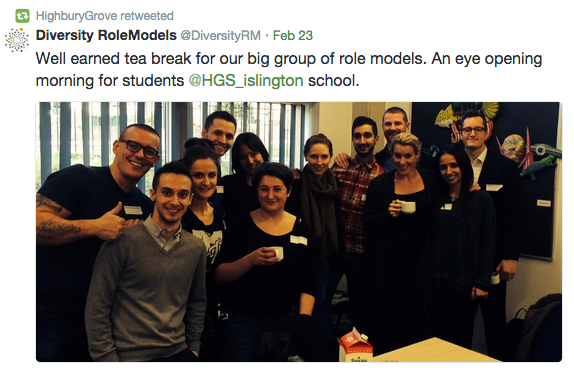 Diversity Role Models ran the workshops; they were superb – giving students a chance to air their views in an open and direct manner. 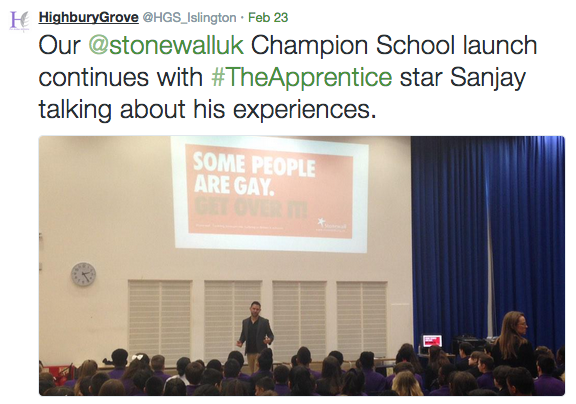 Sanjay Sood-Smith, the Apprentice contestant and Stonewall ambassador, gave assemblies about his experience as a gay person through being a teenager, moving on to study maths at university and starting his career. Perhaps the highlight was meeting the Mike Jackson, the subject of the film Pride, founder of Lesbians and Gay Men Support the Miners. He told students about the shared struggle that miners and gay people experienced and the bond that developed between the groups. An inspirational man!